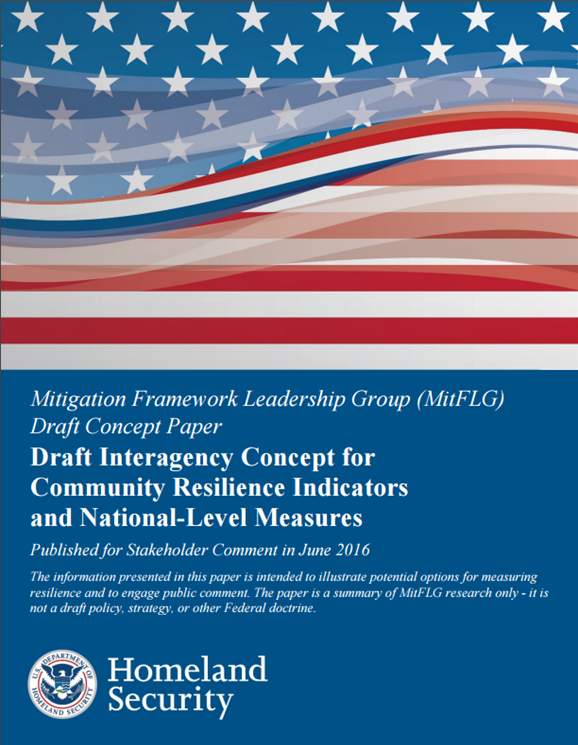 Last month, the Mitigation Framework Leadership Group (MitFLG), whose members represent federal agencies and state and tribal authorities, published an important study: the Draft Interagency Concept for Community Resilience Indicators and National-Level Measures. This report grows out of the Federal Emergency Management Agency’s (FEMA’s) 2011 National Preparedness Goal, which identified community resilience as a key aspect—a “core capability”—of the mitigation of future disasters. Although federal programs have prioritized local resilience to disasters for five years, no federal agency has yet devised metrics to evaluate resilience. This new report, a response to a 2012 recommendation of the National Research Council, is an important step towards identifying indicators by which to measure community resilience. The report and community resilience are discussed further below the jump. Community resilience refers to a community’s ability to adapt and thrive under changing conditions. In the face of disasters or stressors, such as epidemics, acts of terrorism, or—significantly—climate change, a resilient community is able to withstand significant damage and recover quickly. Resilient communities have robust, redundant physical and social systems that help them perform key functions under extreme circumstances. In a flood, are emergency workers able to mobilize to protect households in danger? During a winter power outage, is the housing stock sufficiently insulated to keep people warm? Do neighbors check on each other in times of stress? As sea levels rise and climate change increases the frequency and severity of extreme temperatures and other natural disasters, a community’s ability to answer “yes” to these questions becomes increasingly important. Though community resilience is an intrinsically local endeavor, MitFLG recognizes that resilient communities are central to nation-wide emergency preparedness and that federal programs can bolster local resilience on a national scale. For such programs to be effective, however, FEMA and other agencies must be able to evaluate the contribution of their community-based work to disaster resilience nationwide. Ideally, federal agencies could measure their programs against relevant, data-driven standards of community resilience. MitFLG aims to develop such standards in the Draft Interagency Concept for Community Resilience Indicators and National-Level Measures. The concept paper names six key attributes of Community Resilience capacity—housing, health, economic resilience, access and functional needs, community planning, and social connectedness—and aligns indicators to each attribute. In addition to defining indicators for community resilience, the paper proposes measures to quantify them and assembles existing federal sources of numeric data. For example (see figure at right; click figure to expand it), the strength of housing resilience in a community can be indicated by housing condition or housing affordability. On a state or national scale, these indicators can be measured, respectively, by the percentage of households with a severe housing problem and the percentage of households where housing costs exceed 30% of household income. Data is already available for both of these measures from the Department of Housing and Urban Development (HUD Comprehensive Housing Affordability Strategy Data). 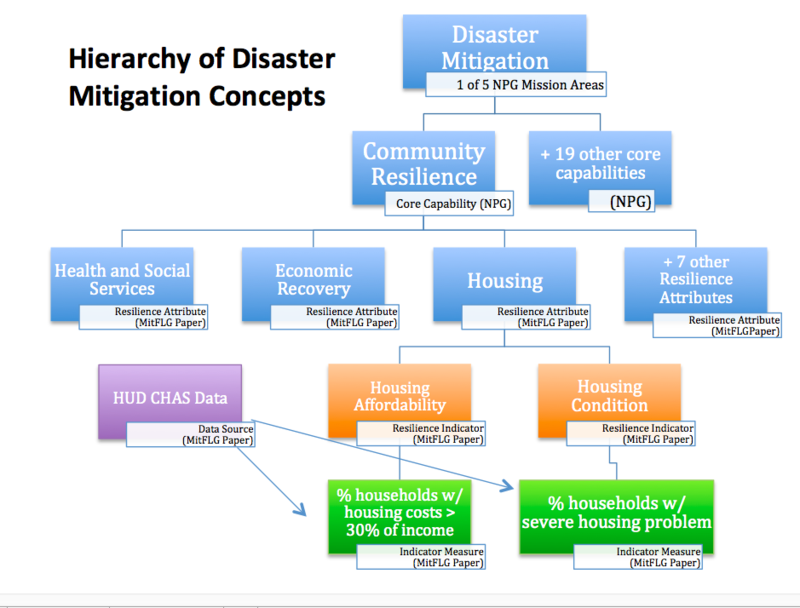 Using these tools, FEMA and MitFLG can assess large-scale levels of housing resilience attainment. However, the concept paper also notes important gaps. A paucity of existing data for some indicators, like mitigation investment or wetlands conservation, currently makes it difficult to quantify several types of baseline measures. Some of the indicators are clearly broader than the data sets MitFLG has proposed to use to measure them: for instance, so far MitFLG has only suggested the EPA’s National Air Toxics Assessment as a measure of the environmental health indicator, even though toxic air pollutants are just one factor in a given community’s environmental health profile. 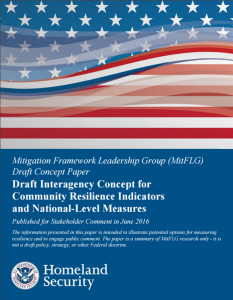 Whether or not MitFLG fills these gaps in the final version of the concept paper, the more important step will come after issuance of the final draft, when the team begins to use the measures to evaluate agencies’ resilience-building efforts. Once fully identified, the measures should help federal agencies fine-tune resilience programs and collect more targeted data. They will set benchmarks of success for resilience at local, state, and federal levels. 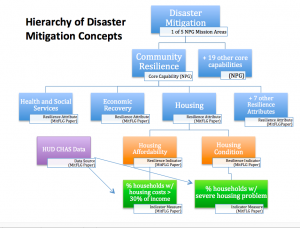 FEMA has invited the public to comment on the Draft Interagency Concept for Community Resilience Indicators and National-Level Measures and its accompanying data mapping application. As of July 21, 2016, FEMA has not set a deadline for receiving comments.